Like pretty much everyone, I used Google nearly every day. In fact probably dozens of times a day. I don’t use it as much as I used to due to privacy concerns and there are no shortage of alternative search engines and service providers that don’t misuse my data or let untrustworthy governments spy on me any more than they can already (which is a lot in the U.K. with all our spy cameras or surveillance and crime prevention cameras for those who don’t value their privacy). 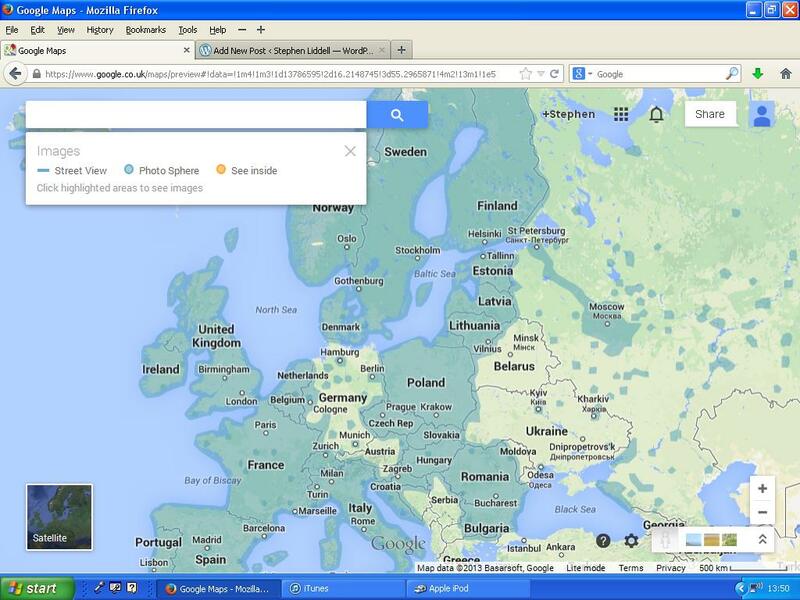 However one function of Google I use a lot is their maps. When Google rolled out their Streetview it made finding locations a lot easier and sometimes I admit I just like having a nose around places I used to live or visit, holiday sightseeing locations, or just from curiosity looking at the scenery and buildings. In the corner of this field, we camped for a week. Little did we know it was just a mile from the wettest place in Britain! Most of my family live hundreds of miles away. 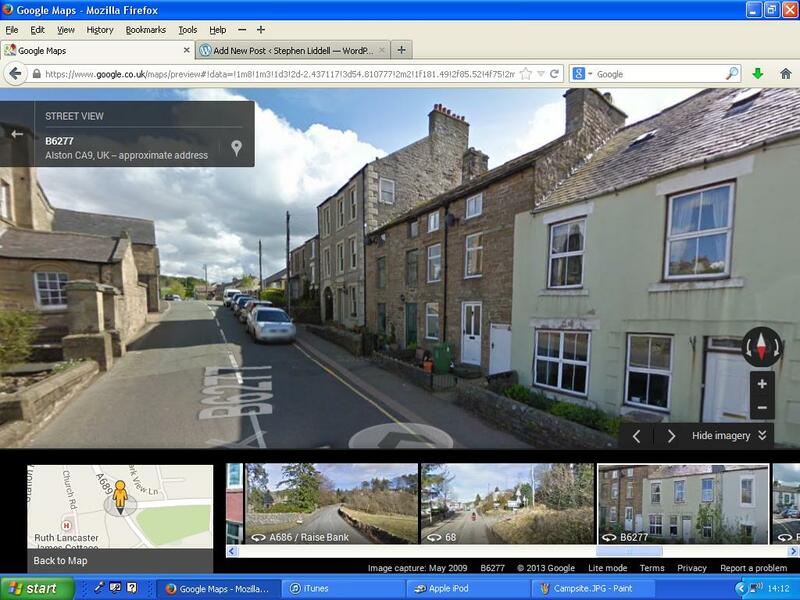 Streetview lets me revisit my old haunts. 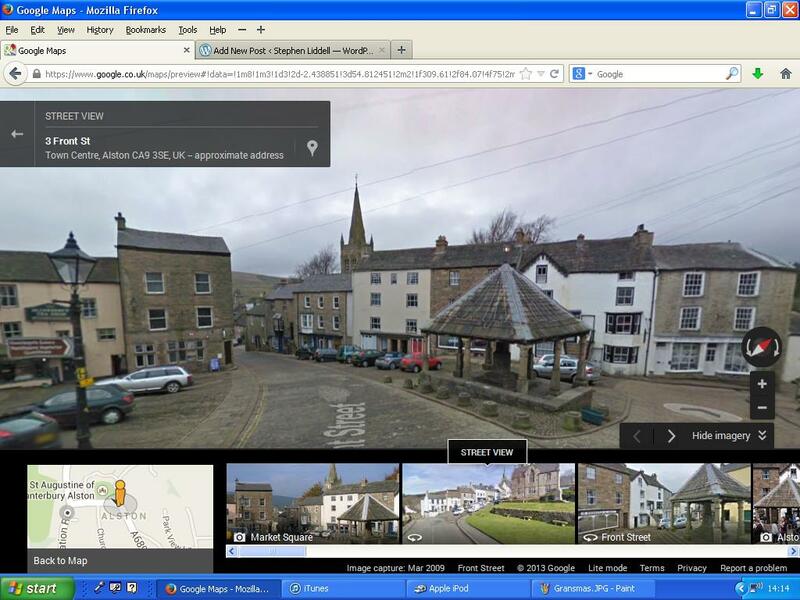 Market Square in Alston where Grandma lived. A tiny old place on the steepest of hills surrounded by fells and moors. 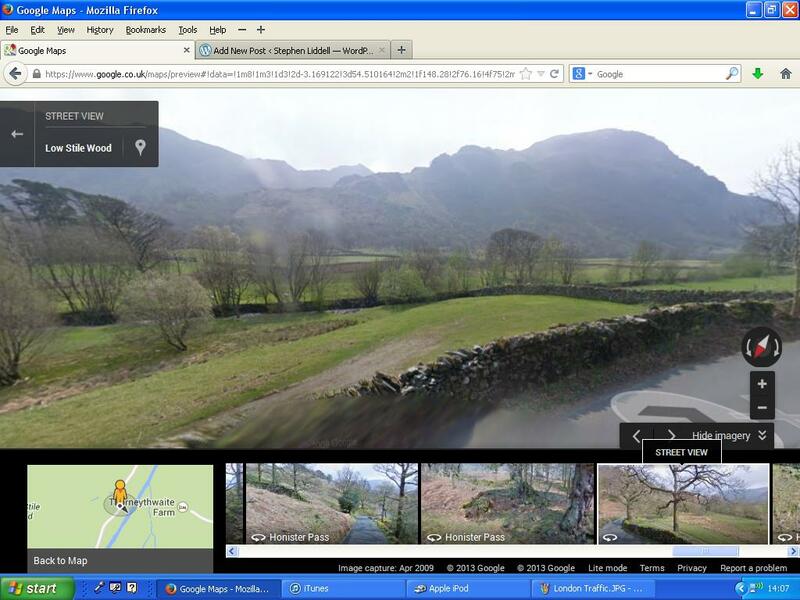 Streetview is great but it doesn’t capture the silence or fresh air. 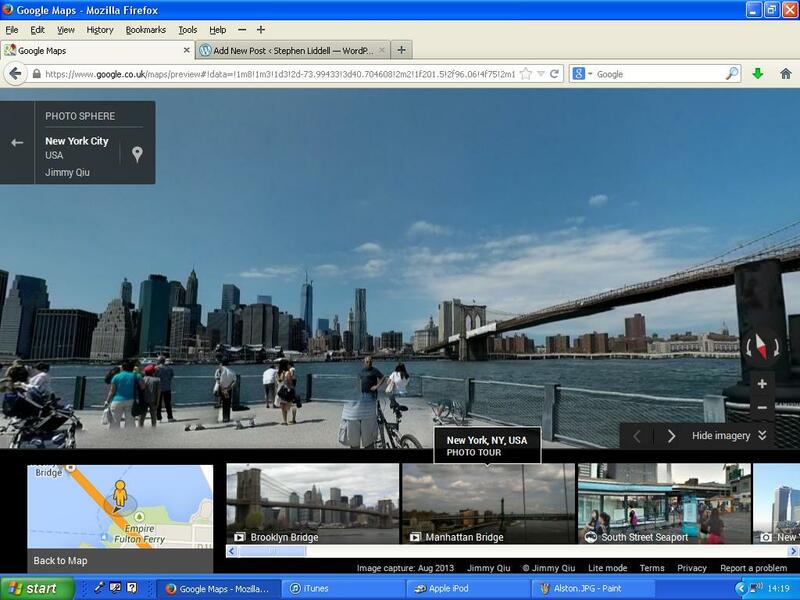 I’ve never been to New York… until today on Streetview. I have an odd obsession with borders and today have been looking at the streetview of Belarus, the last dictatorship in Europe… well I’m going to include Russia too but Belarus doesn’t have any streetview images in at all so you can happily streetview your way around Poland or Lithuania and then you reach a dusty old border post and the streetview goes no further. On a practical level, the aspect of Google Maps I find most interesting is that of their feature which displays how quick the traffic is flowing. Green is good, orange some minor delays, red is major trouble and at least until a few months ago, black meant you weren’t going anywhere. When I used to drive around London on my daily commute everyone in my office would complain if they had an orange or a spot of red but to me, anything other than prolonged black sections was a bonus. You might think that the traffic speeds are measured by sensors in the roads or by some sort of police or highway surveillance system and indeed in some places, this does indeed feed into the system. A few days ago however, I wondered how Google knew what the traffic levels were on the local residential streets around where I live. There are no cameras, sensors or anything else here and yet unnervingly Google Maps has frequently updated traffic details with any delays being exactly where I knew they would be. As my street is about a mile from a really busy road and road it feeds off continues for another mile or two I noticed that at different times of the day, normally very quiet periods, only the section of road near the main road has any colours on it from Google and as the day proceeds more and more of the road shows up. Bizarrely NW London seems to be moving today at 2pm. The whole map will turn redder than a jam tart in an hour or two. I did a bit of investigating on this as I realised Google must employ other methods and though I wasn’t surprised that they did, what did surprise me was how they did it. 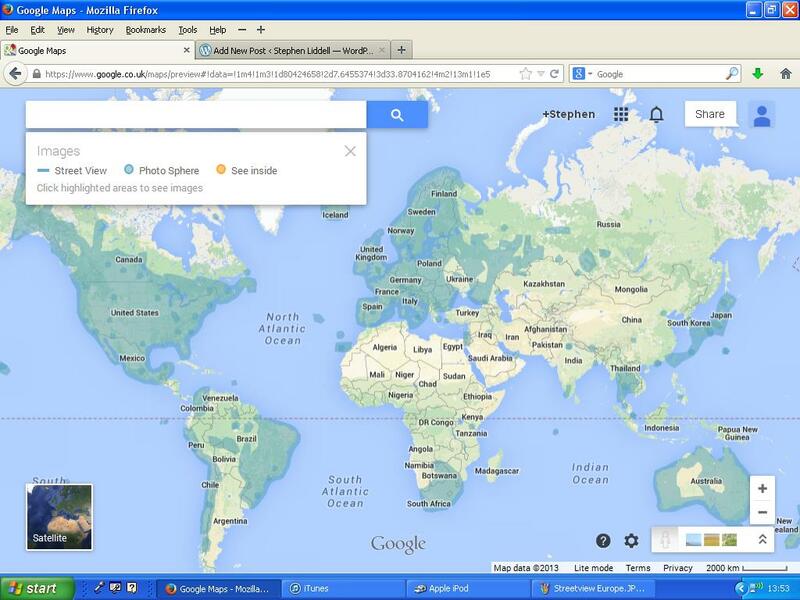 Google track the speed of your smart phones as they are in your car driving around. If your car is stuck in traffic, then your phone is moving much slower if at all and so Google have live indicators or just how quickly traffic is moving. Quite ingenious really and this is why the streets near me don’t have any traffic congestion mapped at quiet parts of the day, because what traffic there is dissipates from the main road too quickly for Google to have the necessary number of moving phones to track on each roadway. Only during the busy parts of the day is there enough traffic moving around the village for their to be enough meaningful data. This is one aspect of Google that doesn’t bother me at all. I don’t own a smart-phone of any sort. My mobile (cell) phone is just one or two steps above having two plastic cups connected with string and stick to the original idea that a mobile phone is only needed in times of need and definitely not worth spending hundreds on. I’m a bit old fashioned that way, televisions shows are best seen on the TV and the internet is best seen on a computer… with as big a monitor as possible! If my phone can send and receive the odd text message then that is all that I ask for. Still I suppose I really should thank everyone who has a smart-phone and so makes my driving that little bit easier to plan. Apparently all this phone tracking data is totally anonymous and no-one at Google let alone anyone else can identify your phone from everyone elses. That’s what they say anyway. There is also an option buried deep within the Android settings to disable this. 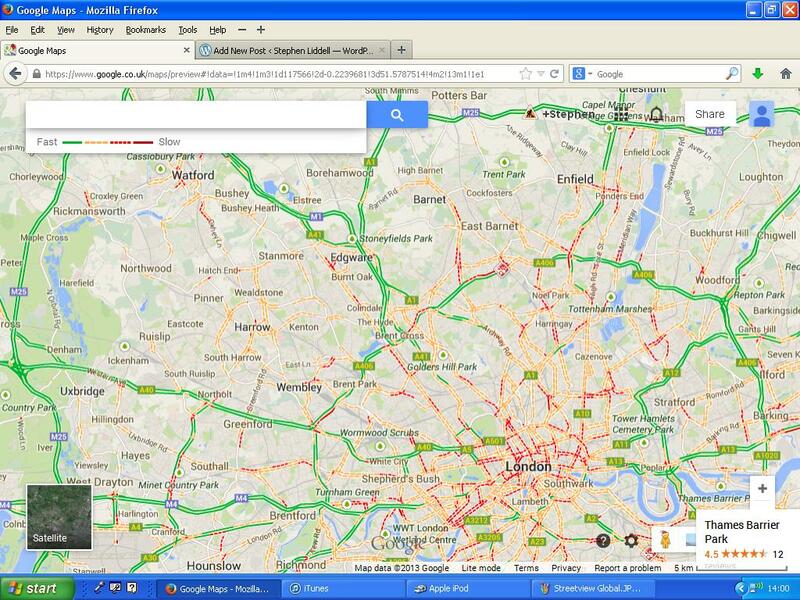 The long term plan is for Google or others to find a way to send a percentage of map viewers by alternative routes in times of heavy traffic but no-one can quite work out the way to do this, especially as for local traffic most people know the short-cuts anyway and are unlikely to take a route to help other road-users just because Google tells us to. Also there is a risk that a previously uncongested road gets totally swamped my motorists all trying to go down the same short-cut as suggested by Google. I wonder which element of Google you use the most? Do you have any concerns about corporate giants or the state keeping tabs on you, even if only to sell you more stuff. Does anyone else have a phone with buttons and a tiny old yellow/green screen? This entry was posted in Science and Engineering and tagged Alston, Android phones, Google, Google Traffic, Life, Maps, Spying, Streetview, Technology. Bookmark the permalink. Interesting article, Stephen. I really like street view. And revisiting old haunts is a great idea. I never think to do that. Thanks Cindy. I revisit places quite often to see how things have changed or how they have stayed the same. Its quite therapeutic! TomTom were doing this years before Google and actually use data from all the phones on the network not just smart phones. The updates on your device are done every three minutes. They also figured out how to reroute you to quieter roads to avoid jams in real time. To be honest I couldn’t live without their HD traffic service, it’s been keeping me sane for many years! Wouldn’t touch google or an android device with a barge pole though, much prefer to keep my privacy in tact instead of having every shred of data sold to the highest bidders. I didn’t know that the TomTom kit was doing the same as Google but earlier, better and without the snooping. I have to rely on Google Maps as you say, even driving to the shops can be a nightmare these days let alone in town or on the motorways. I have to rely on the fact that their will be no new crashes or hold-ups from I leave the house of course and also have to take some back roads to avoid queues that were present when I left home but probably gone by the time I would have reached them. I can’t take that risk with the M25 though! Good post, I like your stuff a lot. Personally, when I’m in my car, my phone is off. I’ve had too many nasty experiences with phones in cars, besides I can always call back when I’ve arrived.